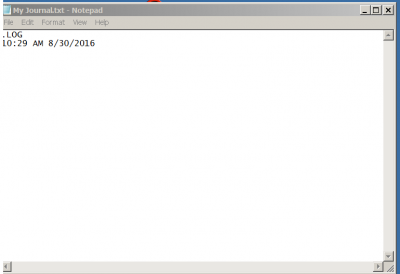 Subscribers: How Cool is Windows Notepad? Turns out VERY! I don’t know anyone who is enthralled with Windows Notepad. Most folks figure it is just a basic program and don’t bother with it much at all. Turns out that Notebook is a whole lot more robust than one would think at first glance! If you want to learn more about this handy little program, read on to learn about some of its hidden tricks. I think you will have a whole new respect for the Notepad when you are finished! Use Notebook as a Journal? Why yes you can! You can even add a timestamp to it, which makes it just perfect for adding your journal entries when you have time throughout your day. How cool is that? Who knew the lowly little Notebook was capable of such things? Now, the net time you open your file, you should see the current date and time appear in it. All you need to do now, is click your Enter key and start keying in your thoughts and dreams to be read for posterity! As you may have surmised, every time you open this file, a new timestamp will appear. Another little shortcut for this – if you just want to add a timestamp quickly is click F5. This will correspond to the Time/Date item hidden in the Edit menu. Click on File | Page Setup to display the dialog box. Now at the bottom look for the Header: and Footer: fields and key in the content that you would like to display in your header and footer! Do not be alarmed if you do not see your header and footer in your document. It is supposed to be that way., but the elements will definitely appear when you print your document. 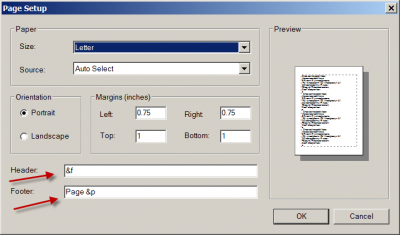 Also be aware that there is no way that I know of to save your header and footer content from the Page Setup dialog, so you will have to add it manually every time you print your file. You also cannot set up different headers and footers in Notepad as you can in Word and other processors. Still and all, who know the little old Notepad could do this? Now YOU do! Most folks are not aware of half of the things you can do using your Calculator in Windows. Below is but one of the cool uses. For planning anything date related, the date calculation function is great. It allows you to calculate the difference between two different dates. For instance if you were born on August 17, 1957, this function will calculate and tell you that on August 17, 2016 you were 21,559 days old! I am not sure that information would be very valuable to you, but there are many other uses for this function, such as wedding invitations, vacations, etc. 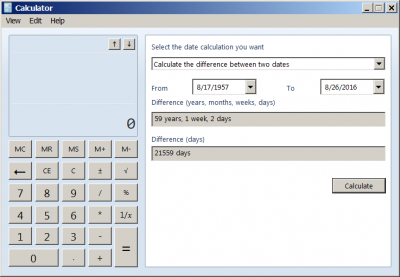 This function will also allow you to add or subtract days from a specific date. Say you have a 4 month deadline – this tool will allow you to figure out what that date will be. Warranties – you can figure out how many days are left! I am certain you will find lots of uses for this! This is a little known feature in Windows – even a lot of Information Technicians are not aware of this. The Windows Steps Recorder can provide your IT person with a detailed list of everything you did up to and including the when your issue began. This is a pretty amazing feature! The Steps Recorder will pack the recorded steps in a handy little zip file that you can then e-mail to your technician, who can then open it and hopefully be able to pinpoint exactly where things started to go south, which in turn, will aid them in resolving your issue quickly. Note: The recording made by PSR is in MHTML format which is viewable in Internet Explorer 5 and later in any Windows operating system. To open the file, first open Internet Explorer and then use the Ctrl+O keyboard shortcut to open the recording. You should know before you use it that it will NOT record any password. So if you have to open a file with a password, you can safely record the steps. Your IT person will not be able to obtain your password from the Steps Recorder. So my good friend Anne, that I have worked with for years now, had a Word issue yesterday. She had vetted a transcript and highlighted the salient parts for her attorney so he could refer to them during a trial. Her problem was that when she printed the highlighted transcript, the highlighting did not show up. She had originally highlighted her Word document using the color yellow. So I said well, just use another color, like grey and perhaps that will show up better. Anne is a newcomer to Word. She has used WordPerfect for years. She has had no formal training using Word and had adapted to it extremely well, but she asked me how to change the color. Having faith in Word, I replied that I was sure that we could just do a global find and replace and do it all in one fell swoop. You see her document was over 200 pages! She certainly didn’t want to have to go through it and change each one! So I took a look-see and it was not immediately apparent to me just how to go about this. So I researched it a bit and we tried several things and it just wasn’t working for us. By then I was determined to find the answer and it was indeed very easy. Open the document whose highlighting you would like to change. 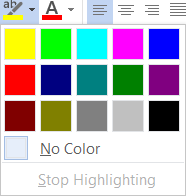 On the Home tab of your Ribbon, in the Font group, Select the new Text Highlight color of your choosing by clicking the drop-down arrow next to the Highlight Color icon. 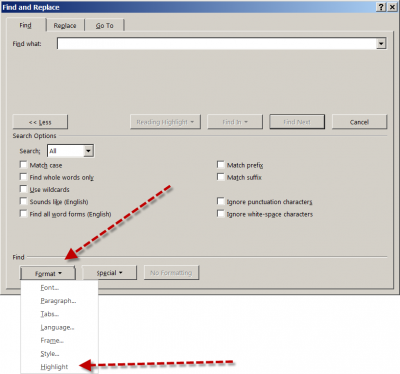 Click CTRL + H to open the Find & Replace dialog box. Click in the Find what area. At the bottom of the dialog box, click the Format button. If you do not see that, click on the More button and then the Format button. Click inside the Replace with box. Click on Format | Highlight. All of your highlighted text should now be highlighted with the new color you chose. Another little trick to add to your Word arsenal! Summer is quickly approaching it’s end and it makes me sad. Oh, I know it will stay warm for a while yet but I like the promise of summer, getting outdoors and doing things you cannot do when it’s cold and planting and watching the fruits of your labor growing – all of that and more! I have had a very busy summer. I promised myself that I would get to the office early and take a two mile walk before my work day started every morning and I have pretty much stuck to that all summer long. I intend to keep it up until it is so cold I cannot do it. I feel better and look better. I haven’t really lost any pounds but something went somewhere because I have gone down a size (always a good thing). I vacationed with the kids and the grandkids and visited back and forth with them. I went to see bands perform and I took hikes. All in all, I have had a really nice summer and am grateful for it. I have also knitted a bunch of hats for babies at the local hospital and for the homeless. I try to remember those that are not as fortunate as me and I hope that you all do as well. I think you will find some very useful tips in this newsletter. If you have a useful tip, let me know about it. Until next time, take care of yourselves and each other. Remember we aren’t in this alone! It is always helpful to know both the mouse and keyboard methods to accomplish the task at hand in Excel. Personally, I like to use my keyboard because that is usually where my hands are already! Below are a few keyboard shortcuts that you will find yourself using all the time – selecting columns and rows. To select the entire row where your active cell is located, simply depress your Shift key and click on your Spacebar. To select the entire column where the active cell is located, depress your CTRL key and click your spacebar. It matters not which cell is active when you do this. If you want to select rows 1 through 5, use your arrow key to move to any cell in row 1. Now depress your Shift key and use the down arrow to select down to row 5. Click Shift + click Spacebar. The entire rows of 1 through 7 will be selected. To select columns A through E, use your arrow key to move the active cell to column A.
Depress your Shift key and press your arrow key to select over to column E.
Now columns A through E will be selected. Subscribers: How to Use the Spike in Word – A More Powerful Clipboard! Copy and Paste is such a nice feature and easy to use as well, but it does have its limitations, that being its one at a time Clipboard nature. The Spike, on the other hand, will help you to gather data from multiple areas in your Word document and then paste all the content to another location in your document or into another word file or even to another program! Using the Spike allows you to create lists of text from different parts of your document (i.e., perhaps you need a summary of the headings in your document or the main points). Highlight your text and click CTRL + F3. This will move your information to the Spike. If you want to copy text instead of move it, you should now click CTRL + Z to undo your last action. It will restore your deleted text but will not affect the copy already stored on the Spike. To collect more information, continue the process with CTRL + F3 as many times as you like. Word will add all the selected text to what already resides on the Spike. To paste the collected information into a new document or another location, click CTRL + Shift + F3. Your Spike will now be empty. Place your cursor where you want the Spike contents pasted. The Spike is an AutoText entry. As long as you do not wipe it empty with the CTRL + Shift + F3 shortcut, the contents will be retained even when you close Word or reboot Windows. Ok, this is an old tip, but one that definitely bears repeating as I get many, many inquiries on this subject. There are many times when you may need to know this. Suppose you are creating a handbook for machinery or you are writing a technical manual or article and you need to include schematics, charts, etc. I find that that using both portrait and landscape orientation in the same document definitely helps accommodate large charts, graphs, photos, and diagrams. Using the same orientation will help to avoid creating an additional document to accommodate wider content in your document. 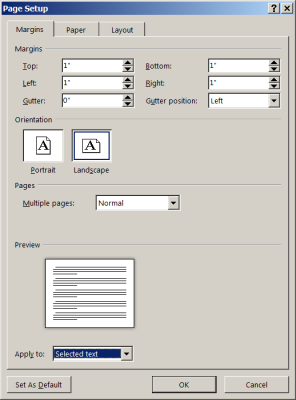 Select the pages or paragraphs that you would like to change to portrait or landscape orientation. Go to Page Layout | Page Setup. Click Margins and select Custom Margins. In the Apply to list, choose Selected text. Word will use section breaks to give your selected text their orientation. If you select a part of the text on a page, but not the entire page, Word will place the selected text on its own page and the surrounding text on separate pages. You might at some point want Excel to generate a unique number for your worksheets. Suppose, were creating forms such as statements, invoices, etc., and you want a unique number for each form. And you also want Excel to remember the number from one session to the next. The macro will be triggered every time a new worksheet is added to your workbook. It takes the current time, converts it to an integer number of seconds, and then places that value into cell A1. The likelihood of duplicating numbers within any day is very remote, but it is possible that it could happen over a period of time. (i.e., if you created a ticket at the exact same time today that you did previously). This version of the event handler creates a number based on both the date and time. Unless you are creating your numbers very quickly, this approach should reduce the possibility of duplicate numbers generated by the macro. If the numbers must be sequential within your current workbook, then you can define a name that contains the current high value of your number, and then a macro that places that number in a cell on a new worksheet and increments the value of the stored number. Display the Formulas tab of your Ribbon. In the Defined Names group click on the Define Name tool to display the New Name dialog box. In the Name box, enter a name such as MaxNum. In the Refers To area at the bottom of the dialog box, enter an equal sign followed by the value you want used for your next number. Click on OK. The new name is stored in the workbook. 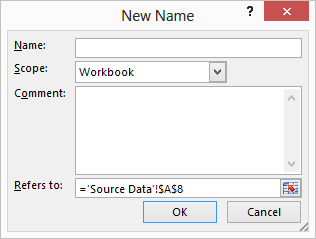 This macro will be executed every time you insert a new worksheet in the workbook. It will retrieve the value you stored in the MaxNum, place that value into cell A1 of the new worksheet, and then increment what is stored in MaxNum. All credit for the macros in this article goes to Allen Wyatt. I am not nearly so clever as he! If you have a lot of bookmarks in your document, you may want to make them bold so that they are easier to see. Fortunately, this is fairly easy to do. 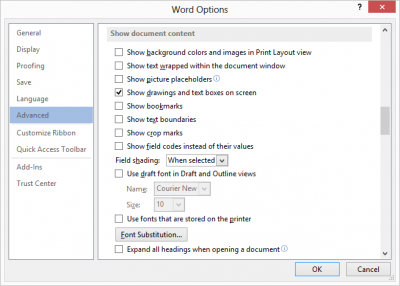 Display the Word Options dialog box by clicking the File tab of your Ribbon and then click Options. At the left side of the dialog box, click Advanced. Scroll down until you see the Show Document Content section. Make sure Show Bookmarks is selected. The result is that any bookmarks in your document are surrounded by [brackets]. These will not print, but will appear on-screen and are helpful in seeing your bookmarks more readily. If you actually want to make your bookmarks bold, you could create a special character style to be used for bookmarks. You could set the style to be bold, and then apply it to all your bookmarked text.